Here is the approval letter for my new credit card. When I originally applied for the credit card, the sign up bonus required $5,000 in spending in 3 months to earn the $500 cash back bonus. But shortly after I applied (and listed below in the letter), the sign up bonus changed to requiring only $3,000 in spending in 3 months to earn the $500 cash back bonus. No complaints from me regarding the lower minimum spend requirement. Wells Fargo also sent me 3 convenience checks for cash advance / balance transfers that offered 0% APR for 9 months. Here are what the convenience checks looks like. I have never used these before, so I shredded these blank checks. I also received a letter with my new credit card. On the front of the letter, it said that you needed your TIN / SSN to activate the credit card, but when I activated my credit card, I only needed to call from my phone and enter the credit card number. I also received a letter telling me that I was enrolled in the “Cash Back Only program” where I will earn 1.5% cash back on all purchases (not a great cash back rate) and that the cash back would appear in my account every quarter. Here is a pamphlet that came with one of the letters that has details on how to customize your credit card design. And lastly, I received a letter regarding my credit card PIN. I immediately called to change my PIN to a number I would remember. I think this PIN will only work at Chip & PIN terminals (like the ones common in Europe). 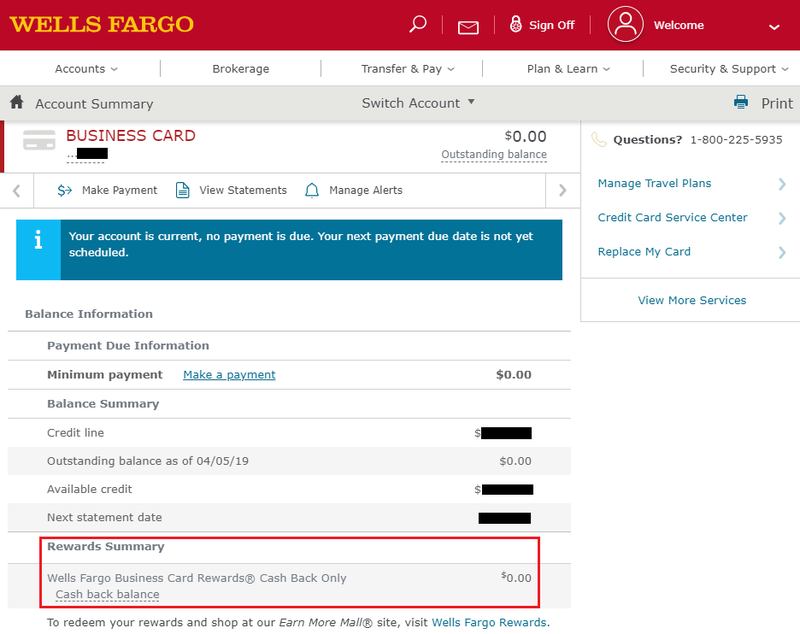 I have an existing Wells Fargo online account that is linked to my Wells Fargo Everyday Checking account (I’m working on getting the $400 new account bonus – thanks Doctor of Credit!). I wanted to add my new credit card to this account, but it took me a while to figure out how to do that online. Thankfully after looking around for a few minutes, I found how to do it. Click the Welcome link in the upper right corner, then click on Account Settings, and then click on Add Account. Magically, my new credit card account showed up at the top. I checked that box, added my phone number, and clicked the Submit button. Nice, my new credit card was added to my existing Wells Fargo online account. Wells Fargo doesn’t make this obvious at all, but you will now see a Personal Accounts drop down menu under the Account Summary header. Click the drop down menu and click on your business account. I then switched from my personal accounts to my business accounts. I would prefer to see both accounts on the same screen, but it is what it is. I clicked on my credit card account to see more information about my credit card. My Rewards Summary section shows $0.00, but it should show $500 cash back soon. If you have any questions about the Wells Fargo Business Platinum Credit Card, please leave a comment below. Have a great day everyone! Do Wells Fargo Business accounts count on your personal credit report ? Business credit cards will not show on your personal credit report, but banks may pull your personal credit report to approve you for a business credit card. I think you’re right, I have heard Discover and Capital One business credit cards do show up on your person credit report.